“Chicharon” or “tsitsaron” is a derivative of the Spanish word “chicharrón” which refers to the dish made of fried rinds, usually from pork, but sometimes made from chicken, beef or mutton (goat). Filipinos love the dish so much that many other meat parts are prepared into “chicharon”. Apart from rinds of chicken, cow and carabao (Philippine water buffalo), Filipino “chicharon” can also be made from intestines of pork, beef and chicken, crop or “butse” of chicken, skin of yellow fin tuna and as I am about to feature here, pork mesentery. “Bulaklak” or pork mesentery is widely available in Philippine local wet markets. 1. Wash and rinse the masentery many times until the foul or bitter odor is reduced, if not totally eliminated. 2. Arrange the pork mesentery in a large, heavy casserole and cover with enough water. Let the water boil on high heat. 3. Scoop out all the scum that will appear on the surface during the initial boiling stage. 4. When the broth is clear, adjust the heat to low and add all the ingredients and continue simmering until the meat is just tender. 6. To fry, heat enough oil in a large wok or deep frying pan. Slice the boiled meat to manageable sizes. With utmost care, deep fry the meat in batches. 7. Flip them over if necessary to attain even cooking on two sides, golden brown and crisp. 8. Remove excess oil from the cooked meat by properly draining it in paper towel. 9. 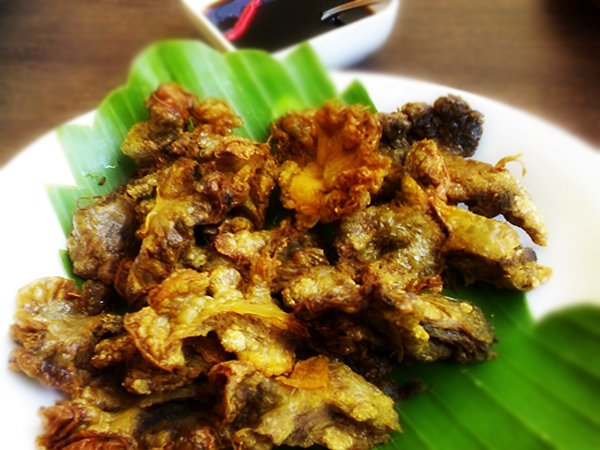 Arrange the “chicharon bulaklak” in serving platter along with your preferred dipping sauce. *Try the Lime Soy Chili Dip or the Garlic Soy Vinegar Dip. Both goes well with this hearty beer partner.